Tucker Brushes; Best in the World. Check out all of these new features on the Tucker Brushes! 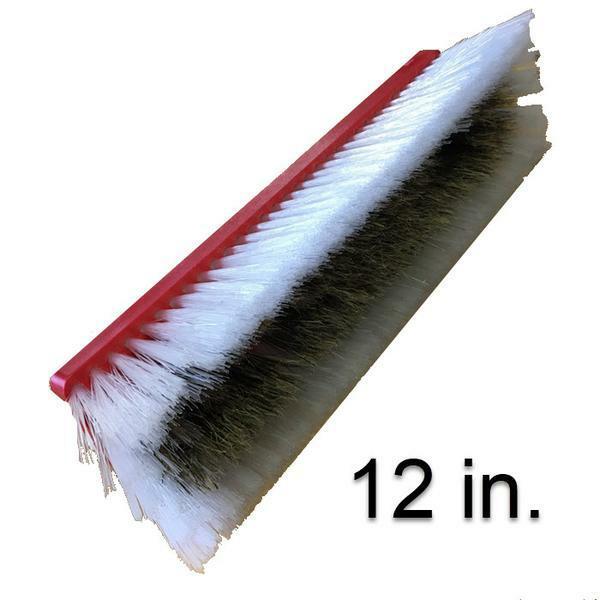 Regular Dual Trim: This brush is available in both 12 and 18in. 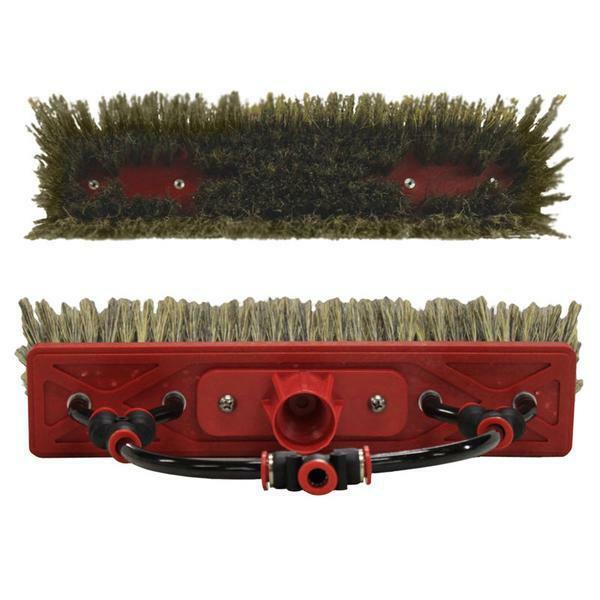 This industry standard brush offers great cleaning with easy-to-learn rinse with the brush on glass capability. The larger the pane or the higher up you clean, the larger the brush is used. The Dual trim pocket offers a pocket for the pure water to accumulate and this “bubble” of water performs the rinse action, leaving no spotting. 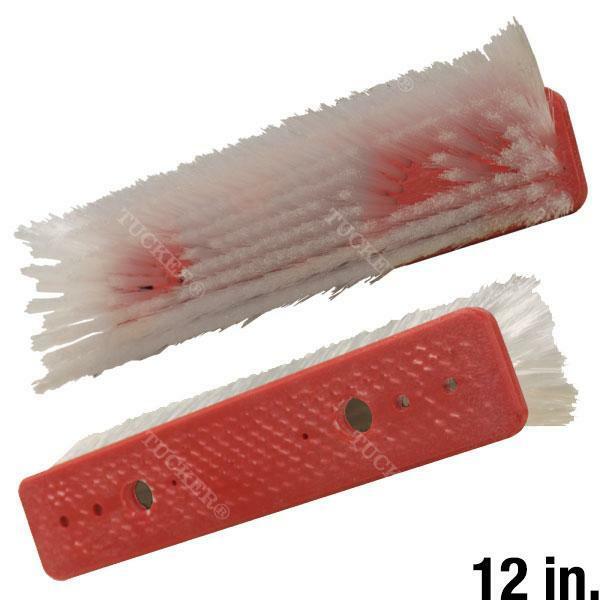 Hybrid Nylon Exterior Bristle: The boar hair internal bristle, available in 12in, is recommended where the glass is not being maintenance cleaned or perhaps is near a highway, stop sign (traffic brake dust) airport runway (jet exhaust) and gets dirty quickly. Press on the pole/brush during the cleaning stroke to get the boar hair to engage and improve the cleaning productivity. Use light pressure when rinsing to let the brush ride on the nylon for rinsing. 100% Boars Hair Bristle: Use this for the most difficult cleaning tasks since the boar hair bristles will aggressively clean the glass. It allows for a significant reduction in cleaning time on the dirtiest glass panels. The Boars Hair brush can also be used with One Restore to restore glass from Hard Water stains or PreCast Run Down. Simply dip the boar hair bristle in the One Restore, shake off the excess and scrub the glass. Lastly, rinse with lots of water or use spray nozzle near the brush and an IPS Sprayer when restoring many large panes of glass. (A whole buildings worth). These brushes come with 4 Pencil Jets which gives the advantage of letting the water “slow down” when spraying. This causes less bounce or splashing of the water. New from Tucker is the Rinse Bar: For many applications the Rinse bar will improve productivity by creating a long narrow bubble of water above the bristle, aiding the rinsing of the glass and leaving a spot free finish. You should not run the rinse water up onto the top frame as it may cause excess dripping or run down from the frame or seal. How do I maintain the boars hair brush to keep it like new? Hi, Good question. Rinse with dawn to clean let air dry, by hanging up.